As we enter the Fall season I have the most exciting news! Our chapter was named Chapter of the Year by CoreNet Global. I was thrilled to accept the award on your behalf on October 16th during the Summit in Boston. As always, competition was fierce for this prestigious award which recognizes the chapter’s accomplishments delivering value to you, our members, during the 2017 fiscal year. I want to extend my most heartfelt thanks and congratulations to our board of directors, leadership team, committee members, sponsors and chapter administrators for their hard work and commitment. Likewise, I would like to thank all of you for continually showing up and being so engaged. This honor affirms our strength, standing and success. Big kudos to all! Our chapter rocked the Summit with over 350 members in attendance! In addition to taking home the top honors, two of our members were recognized. 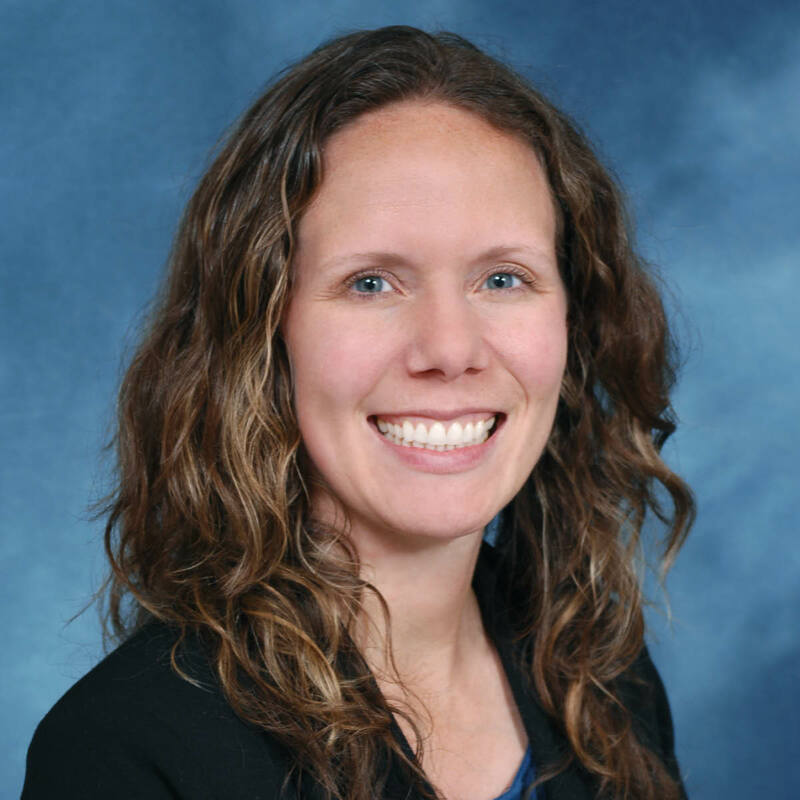 Michelle Lagos, Director of Client Solutions at CBRE, who is our chapter’s Young Leader of the Year, was a finalist for CoreNet Global’s Young Leader of the Year. 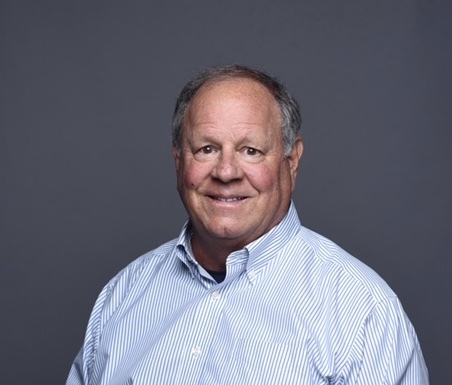 Additionally, Frank Robinson, Retired Senior Vice President of Real Estate and Workplace Services at McKesson Corporation, was inducted into the inaugural CoreNet Global Distinguished Leader’s Circle. While participating in such an exciting Summit, I was reminded just how lucky we are to be part of such a thriving CoreNet Chapter. Our member companies are some of the most dynamic and cutting-edge companies in the world, and our diverse membership truly makes us unique within CoreNet globally. Our vision and mission is to connect corporate real estate leaders, advance knowledge, and promote professional growth. It feels great to know we are succeeding! Perhaps our best example of connecting corporate real estate leaders each year occurred last month with our annual Day on the Bay on October 5th. With CoreNet member Ed Shea, Vice President of Project Management at Colliers International (and a merchant marine officer), at the helm we departed the historic Pier 3 on the California Hornblower for a day full of blue skies, delicious food, libations, camaraderie, laughter, and a spectacular air show featuring the Blue Angels. As always, it was a phenomenal networking experience and truly a day to be remembered! On the knowledge front, we produced three exceptionally valuable chapter meetings last quarter. We focused on the Internet of Things (IoT) at July Chapter Meeting “Are We Being Watched? - IoT, Sensors, Privacy and the Impact on Commercial Real Estate?” In August we hosted “Transportation Nightmares: What’s Being Done?” with Bay Area leaders from Facebook, BART, CalTrain, and Bird. In September we put on: “What the Health is Happening?” which explored applying Well and Fitwel Building Standards. All three programs received high marks. Of course, I am very much looking forward to our flagship event of the year, our 21st Annual CRE Awards Gala, November 15th at the legendary St. Francis Hotel in San Francisco. We will honor our Corporate Real Estate Executive of the Year, Jay Bechtel, Real Estate Project Executive at Google, Inc., and our Service Provider of the Year, Bob McIntire, Founder of Nova Partners Inc. We have another sold out crowd to celebrate our honorees at dinner and the After Party! 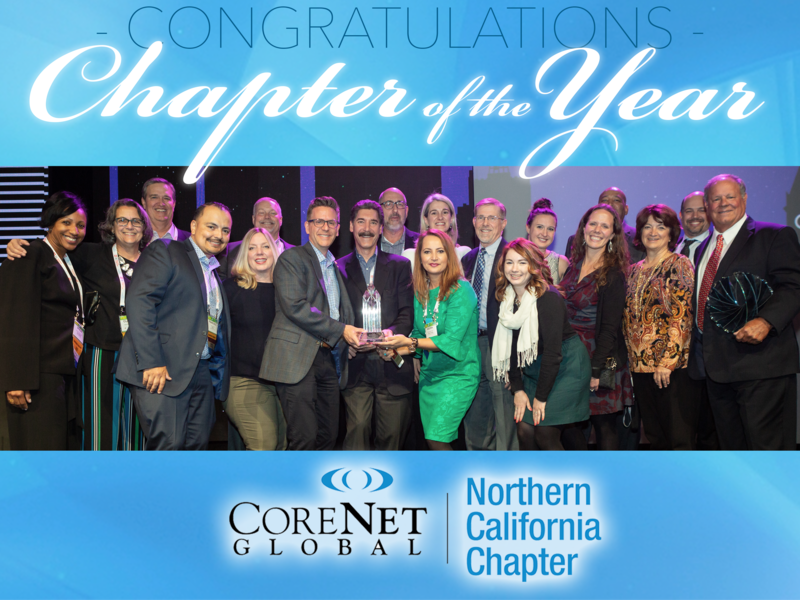 In closing, I want to share that winning Chapter of the Year reminded me of just how much my involvement with CoreNet means to me. Getting actively involved was one of my best decisions! It afforded me the opportunity to forge significant long-lasting personal, and professional relationships. Of equal importance, it helped shape me into corporate real estate executive I am today by helping me increase my knowledge of our industry, improve my leadership skills. It also served to expand my vision of our industry, and put me in the position to influence its future. I encourage all of you to maximize your investment in CoreNet by becoming more actively involved in the Chapter of the Year! Vice President Global Real Estate and Workplace Services Juniper Networks, Inc.
2. What Does the Future Look Like? Transportation Nightmares - What is Being done? Over 150 CoreNet member and guests gathered at Twitter’s Headquarters in San Francisco. The programs committee gathered together a diverse group of experts for an interactive discussion exploring leading wellness frameworks and how they are being applied to both individual projects as well as real estate portfolios. The panel included Moderator Alex Spilger (Senior Vice President, Director of Sustainability at Cushman & Wakefield) and speakers Jessica Cooper (Chief Commercial Officer at the International WELL Being Institute) and Joanna Frank (President & CEO of Center for Active Design). The Northern California Chapter had quite the showing at CoreNet Global's Summit in Boston. We are proud to announce that we were named Chapter of the Year! This is the third time the Chapter has won the coveted title of Chapter of the Year in the category of large/mega chapter. Receiving the award on behalf of the Chapter was John Lucas, Vice President, Global Real Estate and Workplace Services at Juniper Networks and current chapter president as well as local members who were in attendance at the CoreNet Global Summit in Boston. This year's award recognizes the Chapters which excelled in membership recruitment and retention strategies, delivery of the organization's value proposition, delivery of innovative programming and alignment with CoreNet Global's Strategic Plan during the 2017 fiscal year (April 1, 2016 - March 31, 2017). Congratulations to our members, Board, committee volunteers, and generous Sponsors! Frank Robinson, MCR, was introduced to CoreNet Global's inaugural Distinguished Leaders Circle. This is the highest honor to be bestowed upon a member, recognizing a lifetime of contributions to the corporate real estate profession - and the association. 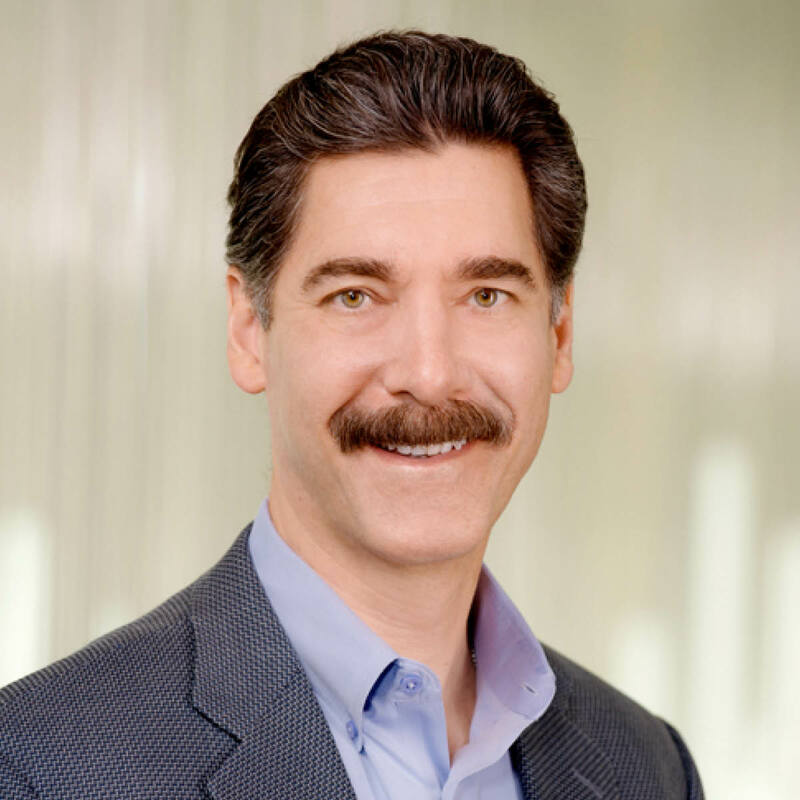 Frank retired as Senior Vice President of Corporate Real Estate for McKesson in 2014. Now, he spends occasional time as an executive coach backed by nearly four decades of highly active leadership and educational roles in CoreNet Global and its predecessor organizations, International Development Research Council (IDRC) and NACORE International. The Northern California Chapter's 2018 Young Leader of the Year, Michelle Lagos, Director, Client Solutions at CBRE was honored as one of three finalists for the CoreNet Global Young Leader of the Year Award at the Boston Summit. Michelle was nominated for the Global Award by the Chapter for her incredible impact on the commercial real estate industry since beginning her career just over ten years ago. While growing an impressive career, she has also been instrumental to the growth of CoreNet both locally and globally. An intimate group of about 10 gathered for lunch with Sara Anderson, Director Real Estate Management with Genentech. Stimulating conversation flowed as she recounted her journey in CRE, offering lots of lessons learned and detailing how she ended up at Genentech. Sara’s openness and honesty facilitated an insightful and informed discussion about the corporate real estate industry. Join CoreNet Young Leaders for our Holiday Party for drinks and appetizers at Natoma Cabana to celebrate a great year and spread holiday cheer with our amazing network. All CoreNet Young Leaders members (ages 35 and under) are invited to attend. Space is limited so register as soon as possible. Women of CoreNet Update - Save the Date! 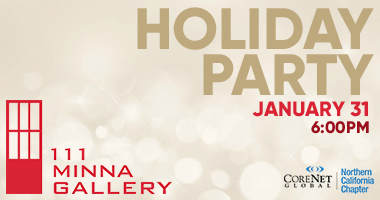 Join WOC for a Holiday Happy hour located at the VBar in Santana Row's Hotel Valencia. There will be a drawing for a $100 gift card. The CAP committee has been busy spreading the word about internship opportunities and actively recruiting participants for Summer 2019! The committee connects CoreNet NorCal member companies, higher education students, and CoreNet Global through meaningful internships focused on building knowledge, networks, and personal excellence in corporate real estate. On October 9th CAP Committee Co-Chairs Brian Thomas, Lead Portfolio Strategy & CRM at CBRE/McKesson and Abraham Villareal, Senior Financial Analyst at Colliers, (both CAP alums) went back to their alma mater, UC Berkeley, to meet with 25 students from the Haas School of Business’ Undergraduate Real Estate Club. Then, on November 1st Villareal along with CAP Committee members Ezra Gonzalez, Sales Executive at Pivot Interiors and Eoin McCarthy, Financial Analyst at CBRE/McKesson, met with 12 students at San Francisco State University. It was the committee’s first opportunity create visibility for CoreNet and the CAP program on campus. The Committee hosted pizza during both visits and discussed avenues for getting a real estate career started. Join us for our December Chapter Meeting as we get ready to head into the holidays with a fun, lively, and very applicable presentation from professional speaker and communications trainer, Cara Hale Alter. We've all experienced it: The higher the stakes, the higher the adrenaline. Just when we need to perform at our best, our internal chemistry can threaten to derail our efforts. With more than 1,500 stage presentations under her belt, Cara Hale Alter has firsthand experience with managing nervousness. She addresses the topic with warmth and humor, and along the way, she offers tangible, real-world solutions. She's an energetic and compelling presenter, having won numerous national awards for public speaking. Day on the Bay Highlights! © 2018 CoreNet Global Northern California. All Rights Reserved.